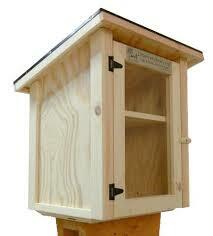 Mental Floss recently posted a list of 11 Facts about Little Free Libraries that I perused with interest. (I love Little Free Libraries—particularly the ones with lurid paint schemes and/or architecture, because I'm pretty unobservant and those are the easiest ones to spot.) Did you know that the Los Angeles Police Department has Little Free Library book exchanges in nearly all of its precincts? The goal is to "engage kids in a positive way and promote reading through Little Free Library’s Kids, Community, and Cops program." I have no idea if that works, but I applaud the attempt.